I love connecting what I am cooking to the season by using ingredients that are only available during a brief window. I'd like to do the same thing more often with my brewing, but the closest I can usually come is brewing beers that compliment the season (strong/dark beers for winter, crisp/refreshing beers for summer etc...). During the summer I do take the opportunity to add fresh fruit to sour beers, but that always seems like adding a layer of flavor rather than an integral part of the composition. The real "problem" is that the two main ingredients in beer (malt and hops) store so well that a beer brewed in December with "fresh" ingredients isn't noticeably better than one brewed at the end of the summer using the previous fall's harvest. Wet hopped beer (brewed with hops that haven't been dried) is one of the only truly seasonal styles there is (if you even want to call it a style). 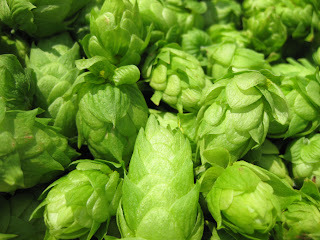 So I was excited when I saw that the hop bines in my backyard produced so many cones during their first year. About half the hops were ready to harvest two weeks ago, but I didn't have time to brew so I vacuum-packed and froze them. Sadly when I defrosted these on brew day they resembled wilted spinach... I was worried the damaged cell walls would impart a grassy-chlorophyll flavor to the beer. So I ended up throwing those out and harvesting another 10 oz of hops (equivalent to 2-2.5 oz of dried hops) while the beer was mashing. I did the bittering addition with commercially dried hops so I could save all the fresh picked hops to add near the end of the boil. The wort and yeast were stolen from a batch of kolsch, although I didn't dilute this half of the wort, so the gravity ended up at a more robust 1.060 instead of 1.050. With Pilsner malt as the base this was not exactly a classic recipe for an American pale ale, but it really wasn't that far off either. After two weeks I bottled the beer and harvested the yeast to pitch into a Smoked Baltic Porter. The Wyeast Kolsch strain is a very poor flocculator, so the beer was still very yeasty and had a bit of krausen hanging around at bottling, but at 1.013 it appeared fermentation was over. If I had enough space in the fridge I would have liked to cold crash the beer for a week or two before bottling, but with two other beers fermenting there just wasn't enough space. Anybody else do/doing a fresh hopped beer this year? 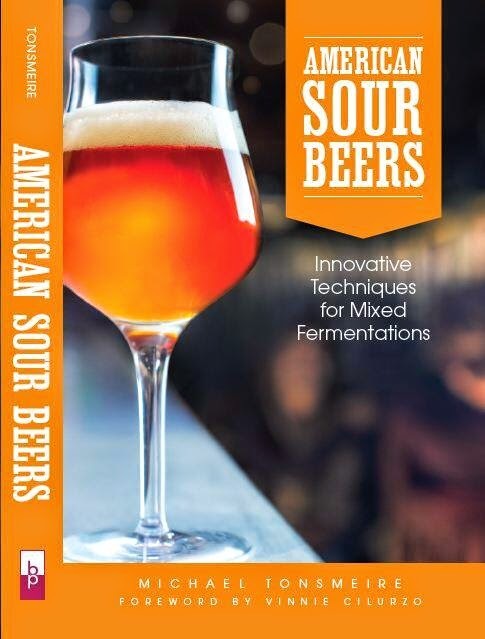 Any interesting ideas for a style besides APA/IPA? 0.75 oz. Amarillo (Whole, 7.73%AA) @ 60 min. 5.00 oz. Cascade (Fresh, ~1%AA) @ 5 min. 5.00 oz. Willamette (Fresh, ~1%AA) @ 5 min. Added 3 g of gypsum to the mash. Double batch sparge. Collected 9 gallons of wort ~1.048. Took about 4 gallons of wort for this batch. Harvested 10 oz of fresh hop blend (Cascades, Willamettes/Goldings?) during the mash. Amarillos were about 3 years old. Chilled to about 80, strained, racked to 5 gallon better bottle and put in the fridge at 55. Pitched ~1 pint of starter after 10 hours in the fridge. Shook for 3 minutes to aerate. 9/02/10 Upped temp to 58 to ensure complete fermentation. 9/11/10 Bottled ~3 gallons with 2.25 oz table sugar. Still pretty cloudy, but I needed to harvest the yeast. 1.013 (78% AA, 6.2% ABV). 9/30/10 A bit overcarbonated, but it cleared beautifully. The flavor is nice, but not nearly as hoppy as I was hoping for. I put compost over my hop garden last fall, and I swear it was like a shot a steroids for my Chinooks. By May 1st they'd reached the top of my 13ft trellis. By July 31st (brew day) I had plenty of ripe cones to put right in my wort. With that said, I brewed 10 gallons of Cascadian Dark Ale and put (i) Cascade (pellets) in the mash, (ii) wet hopped with Chinook, and (iii) dry hopped with Amarillo. Although the IBU's were clearly there, I didn't achieve the hop nose I wanted as the aroma was dominated by the roastiness of the Carafa & Chocolate. Sounds like a tasty batch. This one doesn't have the hop nose I was expecting either, despite the big addition of hops near the end of the boil. Maybe as the plant gets older the aroma will increase? My hop crop was quite odd this year in that I had to harvest everything in early July, not a good crop. However what I was able to salvage from 2 vines was about 5.5 oz. which I used in a 3.6% Session IPA. It's my 3rd attempt at getting this style of brew correct (sessionable IPA) and I'm finally happy with the outcome. Keys are to not over bitter while maintaining big hop character and mash a bit higher than normal, 154. The grain bill was a standard IPA/APA grain bill scaled down to size. The hops were Willamette FWH pellets then the fresh hops plus about 1.5 oz. of pelletized hops through the 20-10 min range & a 1.5 oz dosing of pelletized hops at dry hopping. It's truly a solid bier, not over the top in any way but balanced and I'm happy about that. I did however learn that by squeezing my prodigious amount of hops to extract the fluid and hoppiness from them as the brew cooled I created a ton of haze in my brew. God bless the fresh hop! a really interesting post! I've already dried my only mature vine, a fuggles, and I was thinking of experimenting with one of my germans. What sort of beer would suit a wet-hopped hallertauer, or northern brewer? Also, as far as compost goes, I was pouring some of the yeast slurry onto the patch, when cleaning out my fermenters and it seems to have worked wonders! I think a wet hopped pilsner would be a good option if you want to stay close to the style guidelines (not many really hoppy German beers). A hefeweizen could also be an interesting choice, if you were willing to go off-style a bit. Good tip on the compost, I'll have to remember that when I get mine up and running. I know you said to post ideas for beers other that an APA or IPA, but I had an interesting idea for an Imperial IPA that is working out quite well. OG was 1.100, SG is now at 1.018 (think I'm going to cold crash to get the yeasties to stop, this beer is already more than 10%). Instead of using a bittering addition, I hop bursted with an INSANE amount of wet hops - 6 pounds total. I added 3/4 a pound each of citra and chinook at 20 mins, 10 mins, 5 mins, and 1 min. This beer is certainly bitter (150+ IBUs), but has explosive hop aroma and flavor. I was concerned that doing this might add grassy flavors due to the quantity of wet hops, but those fears turned out ungrounded. Pretty sure it'll be a regular seasonal beer for me from now on. Sorry for posting a year late, but as far as seasonal brewing goes, wouldn't a sort of grassy tasting pilsner (or better yet, hoppy Märzen) have been a perfect use for your frozen fresh hops? Brew in fall, lager over the winter, serve on the first warm day in spring on your , the chlorophyll notes mirroring the shoots of the trees and shrubs all araound? Really enjoyed the Sam Adams fresh hopped Imperial Pilsner back in 2005. Using my fresh hops certainly could have been interesting, but considering most of my harvest (three years ago) was Cascade, not a particularly traditional lager. Not sure how quickly the chlorophyll flavor would fade either.